Current-production Rounds from Prvi Partizan, one of the premier Serbian munitions manufacturers. Brass-cased, boxer-primed, non-corrosive and reloadable. Full-metal jacket boattail bullet. PPU M855, 5.56x45mm, FMJBT, 62 Grain, 1,000 Rounds is rated 5.0 out of 5 by 20. Rated 5 out of 5 by HotRodg from Example: Great Price! Excellent value and quick delivery. What more can I ask for? 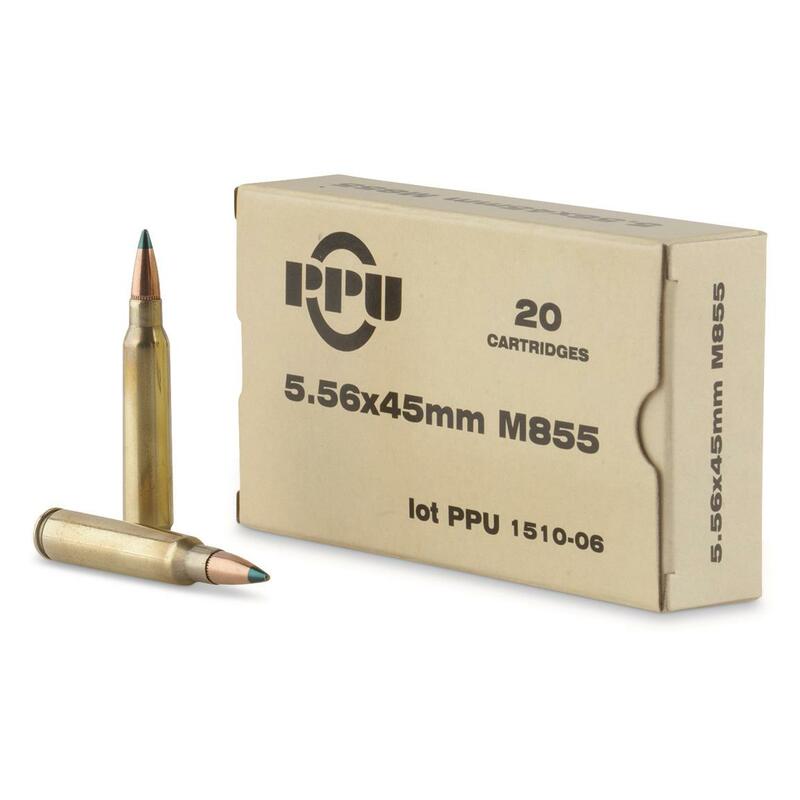 Rated 5 out of 5 by oakridge1956 from Quality Ammo at a Great Price As a Member, I shop at SG often and when I seen they had PPU 5.56 M855 ammo for .31 per round and with the discount code they emailed me cancelling out all the shipping cost but $3.00, I bought 1000 rounds. I've shopped all the Ammo Giants and SG almost always has the best price, on the calibers I use. But you have to be a member. Let's face it guys, several places sell ammo for about the same price, but adding shipping charges puts the per round cost too high. As a member of SG they will often sent you discount codes for free shipping on $49.00 or more orders, or no purchase limit free shipping. If you buy bulk ammo in any popular caliber, the membership fee pays for itself. Rated 5 out of 5 by ssgt mike from Nice product. Solid hard hitting rounds. Rated 5 out of 5 by Bill from Great Price Great price, quick shipping. Very pleased. Rated 5 out of 5 by Papa from Great Price Very happy getting a hold of this hard hitting armor piercing ammo. I have been waiting a LONG time to get this ammo for the price and delivered to my house for free. Sweet. Rated 5 out of 5 by ZanneyJ from Great Ammo Very nice steel core ammunition. Shoots well and leaves not much residue.